What kind of prayers do you pray? Do you ask for protection as you drive to work? Do you recite a prayer before breakfast or dinner? Do you pray with your kids at bedtime or regularly with a friend as you walk? Prayer is a crucial part of our spiritual growth. Maybe if we realized that God does listen when we pray (Jer. 29:11-13), we’d treat the power of prayer with even more awe and a grateful spirit. If you want to mature as a Christ follower, maybe it’s time you moved beyond “safe” prayers to “dangerous” prayers. Each day we pray all kinds of prayers—from the safe or self-serving to the risky and exciting. When was the last time you prayed a “dangerous” prayer—a prayer that put your faith on the line and opened you up to God in a way you’ve never done before? Search me. There’s an old adage that says, “Don’t ask the question if you’re not ready to hear the answer.” A “search me” prayer is dangerous because when you ask God to search your heart for anything that displeases him, he will. So don’t pray a “search me” prayer unless you’re ready for that kind of exposure! Break me. Ecclesiastes 3:3 says, “[There is] a time to tear down and a time to rebuild. ” There’s always something in my life that needs to be torn down—whether it’s discouragement or pride or insensitivity. If you want to be set free to follow Christ fully, then it’s time to pray a “break me” prayer. Stretch me. If you’re tired of going nowhere spiritually or relationally, if your marriage is difficult, or your children are going through tough times and you’re not sure how to cope, ask God to stretch your marriage, your parenting, your spiritual understanding, even your courage to walk with him in a new way. Strength of character is won only by those who respond to life’s challenges by asking God to stretch them. Lead me. When you get settled into a house, a career, a growing family, or future plans, it’s tempting to avoid dangerous “lead me” prayers that may “unsettle” your life. But that’s where faith comes in. We need to believe God loves us and wants to lead our life down a better, more God-focused path than we could ever lead ourselves. When you say, “God, here’s my life. I’ll follow your promptings; I’ll listen for the tugs of your Spirit”—you’ll be surprised what can happen. Use me. This prayer says, “God, I’m available if you’d like to do something great through me. I’m available if you’d like to touch another life through me.” “Use me” prayers are powerful. They create adventures. You never know what the result of these prayers will be, but they’re worth the risk of praying, because when you ask God to use you, he will. And it’s wonderful to be used by God. Praying these five dangerous prayers says you mean business with God. When you prayerfully and courageously move out of your comfort zone, your spiritual life will never be the same. “Search me. Break me. Stretch me. Lead me. Use me.” Pray these prayers and watch what God does. This Week’s Passage: 15 For this reason, ever since I heard about your faith in the Lord Jesus and your love for all the saints, 16 I have not stopped giving thanks for you, remembering you in my prayers. 17 I keep asking that the God of our Lord Jesus Christ, the glorious Father, may give you the Spirit of wisdom and revelation, so that you may know him better. 18 I pray also that the eyes of your heart may be enlightened in order that you may know the hope to which he has called you, the riches of his glorious inheritance in the saints, 19 and his incomparably great power for us who believe. Paul prays for people different than I pray for people. But I’m trying to change that. I love the things that he specifically prays here for his Ephesian friends: that they might know the Lord better, that they might know the hope that they have, that they might know how rich they are in Christ, that they might know His great power in their lives. But WHAT he prays is not what struck me this week. What struck me is the way that he identified WHO he was praying to. He could easily have said “I keep asking that God would give…” Instead he uses two descriptive phrases to identify God. The glorious Father – Glorious!! This is an idea that has captured Paul’s mind as he writes and thinks about all that God has done for him. In verse 6 he speaks of God’s glorious grace. In verse 12 he speaks of “the praise of God’s glory“. In verse 14 he repeats this again. Here in verse 17 he he refers to God as glorious and then in verse 18 he talks about God’s glorious inheritance. It’s as if Paul has seen God in a way that I have yet to see Him. Perhaps it was that encounter that he had on the road to Damascus (Acts 9). Perhaps it was the vision he had of God that he talks about in 2 Corinthians 12. I don’t know how he came to recognize the awesomeness of God’s glorious nature. All I know is that he does. And I don’t. But I want to. And I would prefer that I “get it” before I see Him in all His glory upon my homegoing. Because I see what a difference it made in Paul’s life and ministry to be captivated by the One that he refers to as “the glorious Father.” It made a difference in the that he prayed. It made a difference in the way that he preached and taught. It made a difference in the way that he endured trials and persecution. It made a difference in the way that he dealt with difficult people. It made a difference in the way that he died. Check out these lyrics from Third Day’s song Show Me Your Glory. Click here if you want to see their You Tube performance. As the song suggests, the reality seems to be this: Just a glimpse of God’s glory can change us forever – “never be the same… can’t go on without You…won’t settle for ordinary things… won’t rest til I see You again”. This was def true for Paul. May it be so for me … and you! 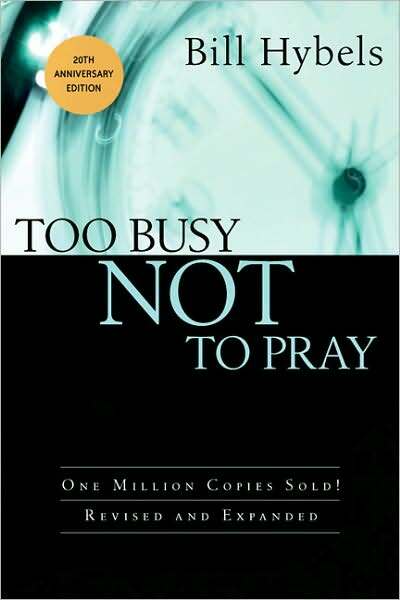 One of the best books I have read on prayer is called Too Busy Not To Pray by Bill Hybels. Here are a few tidbits from the book. Prayerless people cut themselves off from God’s peace and from his prevailing power, and a common result is that they feel overwhelmed, overrun, beaten down, pushed around, and defeated by a world operating with a take-no-prisoners approach. People who are serious about something always make room for it in their schedules. If prayer is important to you, then you’ll find time to do it. God doesn’t want us to pile up impressive phrases. He doesn’t want us to use words without thinking about their meaning. He wants us to talk to him as to a friend or father – authentically, reverently, personally, earnestly. I can write about prayer, you can read about prayer…but sooner or later you have to fall to your knees and just plain pray. Then, and only then, will you begin to operate in the vein of God’s miracle-working ways. Confession is probably the most neglected area of personal prayer. When I lump all my sins together and confess them en masse, I neglect to feel the pain or embarrassment or shame that should be elicited in me. We don’t take confession seriously enough. If we did, our lives would be radically different. When I pray, I’m not just telling God my problems, but rather I’m turning over my biggest concerns to him. It’s only when I’ve put them in his capable hands that I can go about my day in his strength and freedom. There are two main principles I’ve picked up over the years as they pertain to cultivating the type of faith that moves mountains. The first is this: Faith comes by looking at God, not at the mountain. The second is this: God gives us faith as we walk by his side. The most common cause of unanswered prayer is prayerlessness. If you’re tolerating sin in your life, my friend, don’t waste your breath praying unless it’s a prayer of confession. The heart and soul of the Christian life is learning to hear God’s voice and then developing the courage to do what he asks us to do. Some good stuff. My guess is that for you, just as for me, there were a few of these that immediately hit home. You might take some time and do a little prayer life inventory and then create an action plan to move forward. This Week’s Passage: 13 And you also were included in Christ when you heard the word of truth, the gospel of your salvation. Having believed, you were marked in him with a seal, the promised Holy Spirit, 14who is a deposit guaranteeing our inheritance until the redemption of those who are God’s possession—to the praise of his glory. In verses 4-5 we see one side of the divine free will/not free will paradox. In verse 13 we see the other: “heard…believed.” Scripture affirms BOTH that God chose us before the creation of the world AND we willingly choose to believe when confronted with the gospel. Some people have difficulty believing that both can be true. I do not. I may not understand it completely but that is what “mystery” is all about (verse 9). I think I would have difficulty believing in a God that I could completely figure out. The fact that there are mysteries fuels my faith to believe more. Ezekiel 36:26-27 – 26 I will give you a new heart and put a new spirit in you; I will remove from you your heart of stone and give you a heart of flesh. 27 And I will put my Spirit in you and move you to follow my decrees and be careful to keep my laws. Isaiah 44:3 – 3 For I will pour water on the thirsty land, and streams on the dry ground; I will pour out my Spirit on your offspring, and my blessing on your descendants. My post today is not necessarily from anywhere in particular. The thoughts are gleamed from everything that I have been reading. My habit for years has been largely to start with ME when I pray. I have recently begun making a concerted effort to start with God. Acknowledging who He is and how apart from Him I am helpless. Depending on what I will be asking God to do I focus on a particular name of God that fits. So here is a list of some of the names of God that I have found and their basic meaning. Feel free to pray in the same way for my wife as she continues to recuperate. This Week’s Passage: 9 And he made known to us the mystery of his will according to his good pleasure, which he purposed in Christ, 10 to be put into effect when the times will have reached their fulfillment—to bring all things in heaven and on earth together under one head, even Christ. 11 In him we were also chosen, having been predestined according to the plan of him who works out everything in conformity with the purpose of his will, 12 in order that we, who were the first to hope in Christ, might be for the praise of his glory. Sometimes as I ponder my mind thinks like a preacher who is who is putting together a sermon outline. With that in mind you will understand why the four words in this passage that stood out to me all begin with the letter “P”. Pleasure – It is somewhat astounding and overwhelming to realize that the magnificent and glorious God of the universe takes great pleasure in me. I am the delight of His heart. And just as my own kids bring joy to my life so I brings joy to the Father. It pleased Him greatly to lavish His grace upon me and rescue me from the dominion of darkness and depravity of sin. A good reminder. Often I confuse busyness with productivity. We do the same in the church. I need to remember to consistently ask “why am I doing what I am doing?” if I want to live with focused intentionality. Predestined – “…according to the plan…” Here’s an analogy that comes to mind to help me understand this. When it comes to draft time the General Manager of a football team does not draft just anybody that is available. He drafts someone that will fill in the needs that the team has. If they are weak on the defensive line he might draft a tackle. If they need someone fast that can catch a football he would draft a wide receiver. Predestination, or the fact that God chose me specifically, is kind of like this. He has a plan and he wants me to be a part of specifically filling a role in bringing about that plan. Predestination, rather than being a confusing doctrine, ought to be a biblical truth that fuels believers with a great sense of purpose and joy as they anticipate how God will use them to bring about His purposes. Praise – The reason that God has done what He has done in my life is that I might be a testimony of resounding praise to His greatness. It would be foolish to think that anything I do could possibly add to the glorious nature of God. God is fully glorious. That is who He is by nature. But my life can and should point others to Him so that they too recognize just how gloriously resplendent He indeed is. This is what it means to live to the praise of His glory. This is an excerpt from Transforming Prayer by Da niel Henderson. I have been reading this book for the last several weeks and have found it very helpful. “So as we prepare to clearly understand and apply a pattern that can enliven our prayer life and give us a biblical, balanced, approach to prayer let’s review a quick list of “pray this, not that” principles. Pray to seek God’s face NOT just His hand. Pray in anticipation of living triumphantly in the warzone NOT with a satisfaction with the comfort zone. My Comments: I need all these reminders. More often than not my prayer life centers around me me me. I typically have my own agenda when I come to God in prayer. I need to learn to listen, to be still, and to focus on the One who sits upon the throne of grace. I need to come into God’s presence and just sit and be quiet and wait and learn the value of silence. So hard. This Week’s Passage: 4 For he chose us in him before the creation of the world to be holy and blameless in his sight. In love 5 he predestined us to be adopted as his sons through Jesus Christ, in accordance with his pleasure and will— 6 to the praise of his glorious grace, which he has freely given us in the One he loves. 7 In him we have redemption through his blood, the forgiveness of sins, in accordance with the riches of God’s grace 8 that he lavished on us with all wisdom and understanding. We are His loved ones. Is no more a mystery. Glorious grace, God’s glorious grace! We’re wrapped up in the arms of the Father’s embrace. On the day that we believed. Who is now our guarantee. And now at the extreme risk of embarrassing myself, here is an a cappella recording fresh out of the Garage Band Studio to give you an idea of how the melody goes in my head. I admit I’m a wannabe. Sometimes putting Scripture to a melody helps it to sink in to my hard head/hard heart. The main thing that this week’s passage reminded me of is that God did everything that He did for me for the “praise of His glorious grace.” It’s not about me. It’s about Him! One of the best ways to learn to pray is by listening to people pray who know how to pray – who know how to connect with God. There is a great book called The Valley of Vision: A Collection of Puritan Prayers and Devotions that is very instructive. Here is one of the prayers in the collection. I would encourage you to read it once and then go back and pray it as if it were your own. Make note of how different this prayer is from the ones we are used to hearing… or praying ourselves. Thy throne of grace is the pleasure ground of my soul. Strengthen me that I may cling to thee and not let thee go. May thy Spirit within me draw all blessings from thy hand. Let me walk humbly because of good omitted and evil done. My Comments: What a prayer. Every sentence is worth pondering the implications should they turn in to answered prayer. I’ve highlighted a few lines that really jumped off the page at me as I thought them through – though all of them are staggering to my soul. I hope this prayer grips you as it does me and drives you to want to learn to pray even “mo bettuh”.